The Slow Blood Body Constitution essentially originates from a weak flow and distribution of Qi, the vital energy seen in the form of oxygen, blood, etc in our body. A weak Qi has a direct negative impact on blood circulation and can thereby cause the Chinese Medicine syndrome of blood stasis. In a general sense, Blood Stasis often leads to dull and dry skin; sometimes bruises will appear on the skin even without any wounds or injuries. Telling signs of a Slow Blood Body Constitution are hair loss, poor memory, migraines or black eye lids – not because of insufficient sleep, but rather because of blood stasis in the whole body which is most visible under the eye since the thickness of the skin under the eyes is only one third of the normal skin. A Slow Blood Body Constitution needs to be observed regularly and carefully since it can often lead to more serious diseases such as diabetes or cancer. To find out how to lead a healthy and balanced life if your body type is Slow Blood purchase our detailed 15 pages report. The Oriental Balance Peach Seed tea not only employs herbs to eliminate blood accumulations and blockages, it also invigorates the flow of blood. 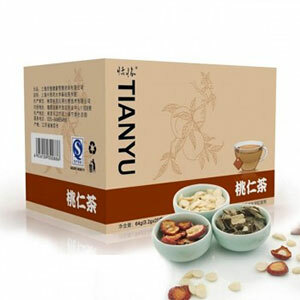 A prolonged treatment with the Peach Seed tea will gradually remove Blood Stasis and improve your health and appearance.